Whenever I do reviews, I’m inevitably accused of selling a competing product. This review is the only review I’ve done (thus far) in which I sell the actual product. Let me assure you, I’m brutally honest. Just in general, but I also intend to be brutally honest in this review. 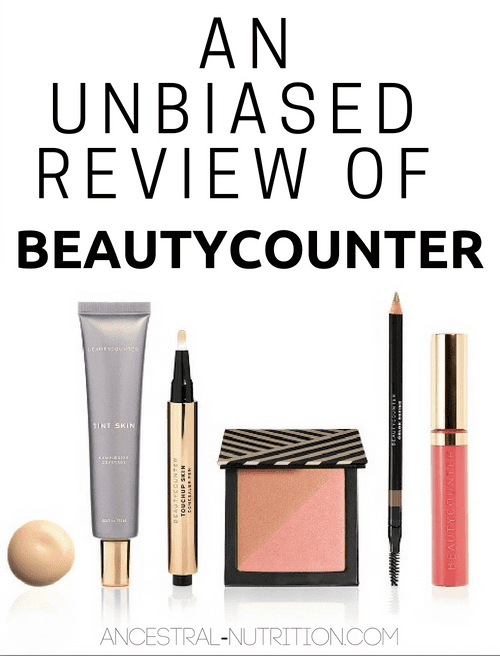 This will absolutely be an unbiased review of Beautycounter, both the ingredients and the products I’ve tried (spoiler alert: I hate some of them!). Let’s get this out of the way – Beautycounter’s products are not organic, they are not the cleanest or safest or most non-toxic on the market. This is a simple fact. But they are safer than majority of products on the market and they’re instituting a lot of change in the the cosmetics game. Beautycounter advocates (quite literally, they lobby for safer skincare) for safer cosmetic laws. Speaking of which, the last time congress passed a law regulating the cosmetics industry was in 1938. Europe has banned over 1400 harmful ingredients. The US has banned about 30. There are over 80,000 chemicals found in cosmetics, majority of which have not been tested for safety. The FDA cannot possibly keep up with testing and the regulation of every ingredient used in the market today. It’s simply impossible. Many people assume that the FDA regulates all ingredients in the cosmetics industry and that they would not allow companies to use harmful ingredients – and the reality is that that could not be further from the truth. The FDA does not test majority of ingredients for safety. One of the reasons I joined Beautycounter was their rigorous testing standards. They third party test for contaminants in color cosmetics at three different points in the development cycle. They test their color cosmetics for heavy metals. They make sure when using a preservative like phenoxyethanol, that it’s below 1%. Additionally, they’ve hired independent researchers to test phenoxyethanol for potential hormone disruption – it showed none in the concentration Beautycounter uses. No other cosmetics company is doing this. What many people don’t realize is that there can be several contaminants, even in organic cosmetics products. Simply for reasons like something was stored in plastic, or because lead is a naturally occuring substance (particularly in mineral makeup). Lead is banned in paint but it’s not banned in lipstick. So you can’t slather your walls with it, but women everyday are literally eating lead. To be clear, lipstick does not contain a significant amount of lead, but of over 400 tested, majority did contain detectable levels of lead (source). How amazing is that? 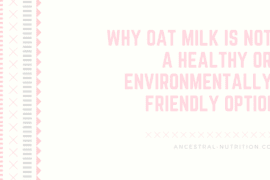 This company is going above and beyond not only to not use harmful ingredients, but they are actively testing their products to make sure there aren’t contaminants. As I stated above, Europe has banned over 1,400 harmful ingredients in their cosmetics. The US has banned around 30. Beautycounter has banned over 1,500. There are thousands of companies out there, some quite popular (shout out to my review of Rodan + Fields) that are using these ingredients throughout their lines of products. They don’t do testing. They have no regard for how these ingredients impact the health of women everyday. Beautycounter may not be 100% organic and non-toxic, but they do a hell of a lot more than any other company I know of. They care about the healthy of their consumers. They rally for congress to finally start paying attention to the harmful ingredients in the cosmetics industry. They perform testing that goes above and beyond. So without further ado, let’s take a look at some products and their ingredients. 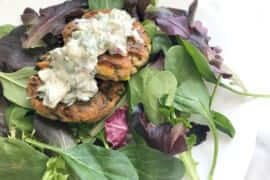 Yes, you can click on each ingredient to learn more about it. This isn’t from me, this is a function of Beautycounter. Aqua/Water/Eau, Coco-Caprylate, Isododecane, Trimethylsiloxysilicate, Caprylic/Capric Triglyceride, Dimethicone/Vinyl Dimethicone Crosspolymer, Isostearic Acid, Polyglyceryl-4 Diisostearate/Polyhydroxystearate/Sebacate, Isoeicosane, Propanediol, Jojoba Esters, Glycerin, Magnesium Sulfate, Cera Alba/Beeswax/Cire d’abeille, Dimethicone, Gluconolactone, Sodium Hyaluronate, Sodium Chloride, Sodium Benzoate, Hydrogenated Castor Oil, Polyhydroxystearic Acid, Lecithin, Ethylhexyl Palmitate, Isopropyl Myristate, Polyglyceryl-3 Polyricinoleate, Prunus Amygdalus Dulcis (Sweet Almond) Oil, Citrus Aurantium Bergamia (Bergamot) Fruit Oil, Citrus Aurantium Dulcis (Orange) Peel Oil, Rosa Damascena (Rose) Flower Oil, Salvia Sclarea (Clary) Oil, Citrus Aurantium Dulcis (Orange) Flower Oil, Vanilla Planifolia (Vanilla) Fruit , Triethoxycaprylylsilane, Titanium Dioxide (CI 77891), Iron Oxides (CI 77491, CI 77492, CI 77499). Aqua/Water/Eau, Caprylic/Capric Triglyceride, Dimethicone, Coco-Caprylate, Trimethylsiloxysilicate, Diisostearoyl Polyglyceryl-3 Dimer Dilinoleate, Ethylhexyl Palmitate, Polymethylsilsesquioxane, Glycerin, Oleyl Oleate, Gluconolactone, Magnesium Sulfate, Sodium Chloride, Sodium Benzoate, Dimethicone/Vinyl Dimethicone Crosspolymer, Tocopheryl Acetate, Cera Alba/Beeswax/Cire d’abeille, Hydrogenated Castor Oil, Lecithin, Polygonum Aviculare (Knotweed) Extract, Titanium Dioxide (CI 77891), Iron Oxides (CI 77491, CI 77492, CI 77499). Aqua/Water/Eau, Cera Microcristallina/Microcrystalline Wax/Cire microcristalline, Acrylates Copolymer, Glyceryl Behenate, VP/Hexadecene Copolymer, Palmitic Acid, Cera Carnauba/Copernicia Cerifera (Carnauba) Wax/Cire de carnauba, Oryza Sativa (Rice) Bran Wax, Cellulose, Methylpropanediol, Centaurea Cyanus Flower Water, Aminomethyl Propanediol, Acacia Senegal Gum, Dimethicone, Microcrystalline Cellulose, Oenocarpus Bataua Fruit Oil*, Rosa Centifolia Flower Wax, Jasminum Grandiflorum (Jasmine) Flower Wax,Hydroxyethylcellulose, Sodium Citrate, Myristic Acid, Stearic Acid, Rosa Damascena Flower Wax, Sodium Benzoate, Phenoxyethanol, Iron Oxides (CI 77491, CI 77492, CI 77499). The two ingredients I routinely see people question are phenoxyethanol and dimethicone, so let’s get started with those. The Environmental Working Group (EWG) database rates phenoxyethanol at a 4 (source). Phenoxyethanol is a preservative largely used in place of parabens. It is used primarily to keep bacteria in check, otherwise the products could be a breeding ground for microorganisms. Studies have shown phenoxyethanol in high doses (including ingestion and completely undiluted) can cause lung and skin irritation as well as nervous system toxicity. I’m not going to sugarcoat that. If I had the BRCA gene or some other predisposition to disease, I may reconsider using it. But let me reiterate, majority of testing on phenoxyethanol has involved a completely undiluted dose. Pehnoxyethanol’s Material Safety Data Sheet (MSDS) refers to 100% concentrations (source). Studies have shown it is safe in concentrations up to 2.2% and it’s used in the European Union and Japan in concentrations up to 1%. 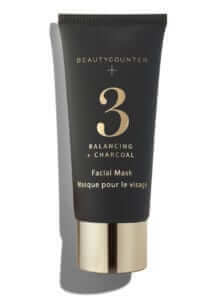 Beautycounter uses concentrations below 1% (source). Preservatives, such as phenoxyethanol, are required for use in products that contain any amount of water in the formula to ensure that potentially hazardous microbes do not contaminate the product. We always use the smallest amount of preservative that gets the job done and scientific studies to-date have shown no evidence that phenoxyethanol may cause harm when used within the limits of Beautycounter’s formulations. So little phenoxyethanol is used in Beautycounter products that it’s an ingredient I’m comfortable using. This is a decision you will have to make for yourself. In the EWG database, dimethicone is rated a 3 (source). Dimenthicone is used mainly to provide a smooth application, which makes it great for products like foundation and concealer. The biggest concern with dimethicone seems to be skin irritation. For me, this is simple. If it irritates your skin, stop using it. Dimethicone create a barrier, which is what allows it to provide an even application. The concern people have with this is that it has the potential to trap bacteria under whatever is being applied. This is why you should always apply products to clean skin. Dimethicone definitely create a barrier which can cause irritation, but I find that people who have any issue at all few and far between. I have sensitive, acne prone skin and I haven’t had an issue with it. Dimethicone is used at or below 6% in Beautycounter products. The largest concern with sodium benzoate is that it can combine with vitamin C to form benzene, a carcinogen. 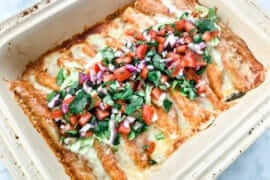 Majority of the controversy surrounding sodium benzoate has revolved around its use in food (ie: the Skinnygirl margarita). Here’s the thing: there isn’t much of an issue at all if sodium benzoate and vitamin C aren’t being used simultaneously. So the concern over this ingredient is unnecessary, unless of course it’s used with vitamin C.
Vitamin C is indeed in the Brightening line of skincare, but sodium benzoate is not found in those products. Sodium benzoate is rated as a 3 on the EWG database (source). 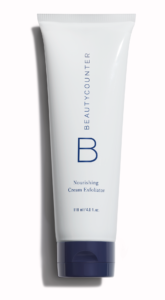 Sodium benzoate is used at or below 2% in Beautycounter products. 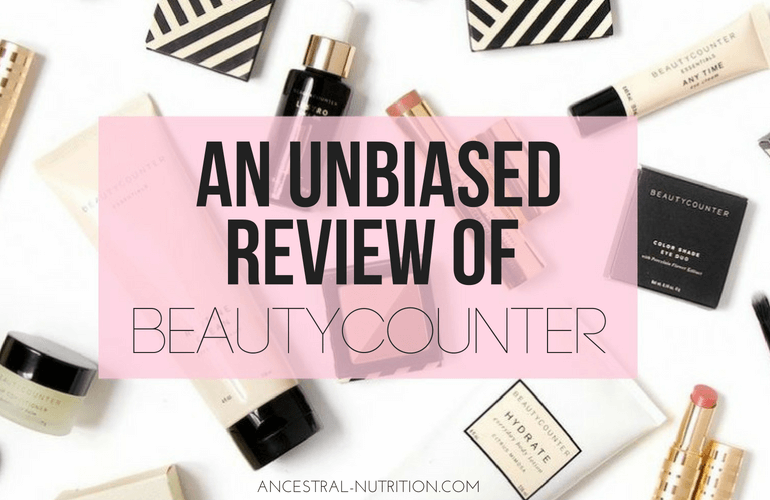 Beautycounter products do contain both vitamin C and sodium benzoate, albeit in low doses and never in the same product. But if you’re mixing products, this is something to be mindful of. Salicylic acid is commonly used in products that combat acne; it’s a preservative and also an exfoliant. This is why it’s in the Balancing Mask – it’s a gentle acid that exfoliates the skin. I use the mask about once a week. It exfoliates so well, leaving my skin super soft. I have acne prone, sensitive skin. It’s best to test a patch of your skin prior to using any acid. The concern with salicylic acid is that it can cause eye irritation (duh! it’s an acid!) as well as skin irritation, especially with repeated and regular use. Is this a shock to anyone? Salicylic acid is first and foremost an acid, albeit a gentle one. Don’t use it daily. Don’t put it in your eyes. Does the fact that it can cause irritation make it toxic? No. Salicylic acid is rated at a 4 on the EWG scale (source). There are only four ingredients in these products I could find that had any question of toxicity or anyone seemed to have much of an issue with. If you have others, let me know. I’m happy to review those as well. But considering there are only four ingredients I’ve found people to take issue with – that’s pretty damn good. 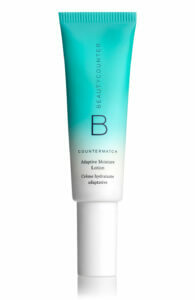 The Flawless In Five set isn’t just one product, but it’s one of my favorite Beautycounter options. It is steeply discounted and allows women to switch out their carcinogen laced, hormone disrupting makeup in one simple step. I particularly love the concealer pen, brow pencil (I fill in my brows every single day, it makes such a difference) and the blush. Okay to be fair I just ordered this but I’ve been waiting for this SPRAY SUNSCREEN FOR SO LONG! 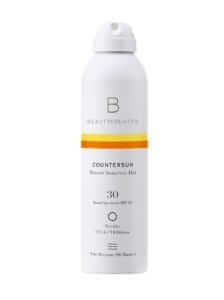 I love a non-toxic sunscreen and this one is air propelled, no aerosol! It’s SPF 30 and mineral based. I can’t wait to use this non-toxic sunscreen this summer. I give my face a spray every single day before leaving my house in the summer. Wrinkle prevention is key! I used this non-toxic baby oil on my son’s dry skin this winter. He was developing tiny bumps on his arms and thighs but after using this they literally disappeared. Like I mentioned above, I am prone to sensitive, congested, acne-prone skin. I HAVE to use a mask to really keep my skin healthy and exfoliated. I use this balancing charcoal mask once a week. The salicylic acid gently exfoliates the top layer of skin, removing debris and dead skin cells. This is exactly what I need. It leaves my skin feeling so smooth and clean. I’m only sharing these products even though I have several favorites because this post would simply be too long if I shared all of them. I’ll likely to a full list of my favorites in a separate post. I wanted to love this tinted SPF but it just wasn’t enough coverage for me. I felt like there was actually zero coverage. While I use SPF on my fave religiously, this just didn’t cut it for me. I’d rather just purchase an SPF to wear over my makeup. I don’t know if it’s just my skin, but I need regular exfoliation. This exfoliator did not cut it – at all. It was just too gentle. I felt like my skin wasn’t being exfoliated at all, in fact I still had makeup on my skin after I used it. That’s just too damn gentle! While I thought this moisturizer provided great hydration – it caused my forehead to get clogged. I started to get more clogged pores and small breakouts. As it turns out, this line isn’t so great for those with acne-prone skin. Good hydration, just not for me. I’ve seen a lot of compensation plans. I’ve been in the blogging game since 2011. I’ve been an affiliate or consultant for well over 30 different companies. Along with Perfect Supplements, Beautycounter is the best compensation plan I’ve ever seen. What I love about it is that it differs from companies like doTERRA and Young Living – you don’t have to keep signing people up under you to make money. Don’t get me wrong, growing your team is a great way to build your Beautycounter business – but you don’t HAVE to do this. Beautycounter pays out 25% on what you sell. This is NOT common in the industry. I’ve been with MLMs before where you make 15% on what you sell int he first month and then 2% on whatever your team makes after that. With Beautycounter, you could literally put a link to your favorite products on your Facebook and you’d automatically get 25% of whatever is bought through your link. I don’t know of any similar company doing this (again, aside from Perfect Supplements). Women can host socials online or in person. You can also choose whether or not you want to build a team. It’s completely up to the individual and not a necessity like it is in other companies. Here is a great overview of the compensation plan that explains it better than I am. Here’s the thing: if you aren’t comfortable with the ingredients, that’s okay. You don’t have to use them. But to see so many people bashing Beautycounter, who albeit is not a 100% organic, non-toxic company, is disappointing. They are not the enemy. Beautycounter is moving the beauty industry forward; they are lobbying for safer skincare. They go out of their way to source responsibly, to perform additional testing and to make sure their products are effective but safe. 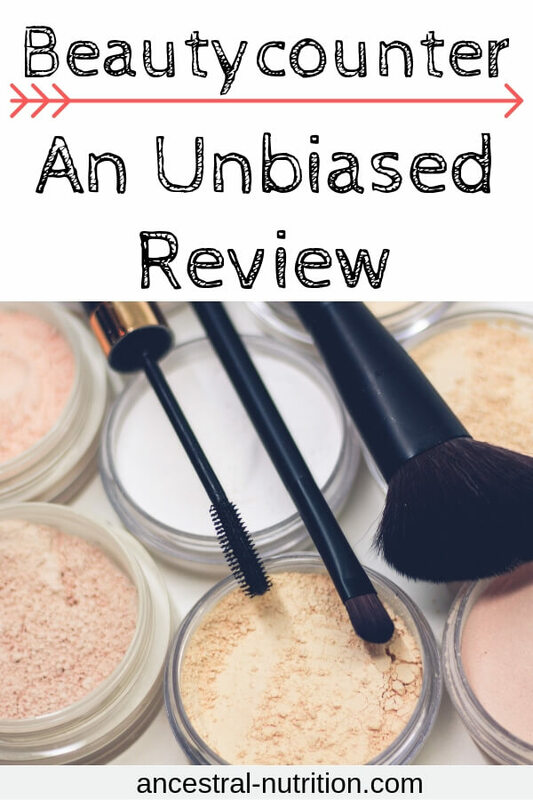 There are so many companies out there that use numerous harmful and toxic ingredients in their products and are completely deceitful about it (what’s up, Rodan and Fields?). There are thousands of cosmetic companies that not only do no testing for safety but recklessly use products that are known carcinogens and hormone disruptors. Let’s go after those guys. Let’s demand better for women. Let’s spread the word about how important it is to use safe skincare and makeup, whether it’s Beautycounter or another company. Please do an unbiased review of Isagenix products! They are a cleanse/ meal replacement company that seems to make some sketchy claims. I’ve actually done one, you can find it by putting “Isagenix” in the search bar!